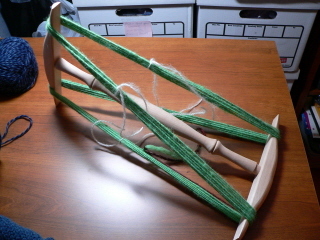 Pretty spindles and pretty yarn. 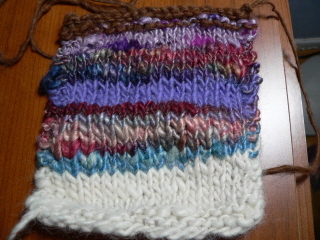 The swatch made with my first handspun yarn. 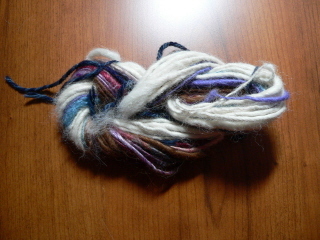 Here, you can see the uneven stitches caused by the very uneven spinning. We all have to start somewhere. Look. All one color, cocoa brown. Clearer but the color's a little washed out with the flash. 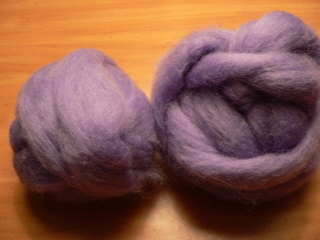 This fleece was very cheap and is coarse, producing what will probably be a very scratchy wool yarn. I didn't want to spend too much on the practice fleece. I don't know what to do with it. 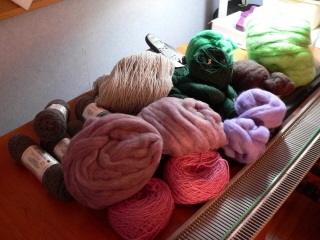 I have a couple of ounces of the same fleece in emerald green. Once it's all spun, along with a softer wool in a softer green, I'll figure out if I can combine them and do something with them. Right now, I'm just plugging away and, thankfully, seeing improvement with time. I'm also working on a poncho for myself (among other various and sundry projects). I'm knitting a turtleneck and pretty much flying blind because I don't really have a pattern for it. I'm making it up as I go along. The pattern is written for about 1 inch or so of ribbing along the neckline (see the finished objects, there are several of them) but I'd really like a turtleneck. I'd like to say I'm following Elizabeth Zimmermann's technique (keep knitting until you're sick of it) but I actually measured the turtleneck on a poncho I already have to come up with an approximate length. We'll see how it winds up. Thursday evening, Bill and I joined Jan and Eric for dinner and a show. We saw Gypsy, the NY City Center Encores production. It got amazing reviews, well deserved as it turns out. Patti Lupone is fantastic. I finally saw Laura Benanti, whose understudy I've seen so frequently in other shows, I was beginning to feel unloved and unwanted. She did a spectacular job as Louise, making choices I've never seen. She made me cry in "Little Lamb" when she choked up at the lines about wondering how old she is and was absolutely fierce in her confrontation with Mama Rose at the end. I also loved her dancing at the end of All I Need Is The Girl. Instead of automatically knowing the steps, she faltered and followed Tulsa as he encouraged her. It was more realistic than I've ever seen before. She convincingly moved from awkward duckling to beautiful swan. And Mama Rose. What can I say? The woman's a force of nature. Loved it. 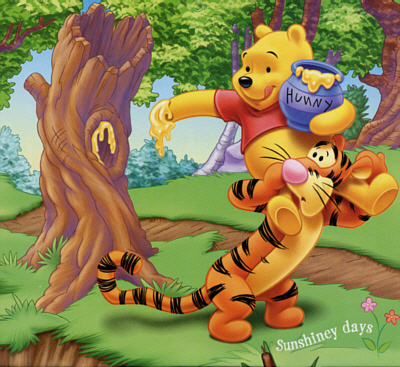 Just loved it. It's a tiny skein but I can't tell you how delighted I am with it. It was so cool to wind it into a ball. Next step is to knit it into a swatch but I'm thinking I might like to just look at it and smile for a little while. 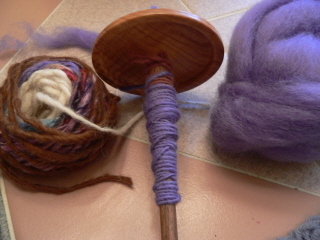 On the spindle is the periwinkle color wool. I thought I'd save this for awhile but I was so encouraged by my first attempt that I think I can use this now. I might actually be able to knit something usable with this yarn when I'm finished with it. It's amazing how time can run away from you. I feel like I've been so busy since we got back from vacation and I'm just starting to get organized. Weird. Anyway, here's a rundown on the recent activities. Warning. This post is picture-heavy. We arrived home from Vermont on a Friday. 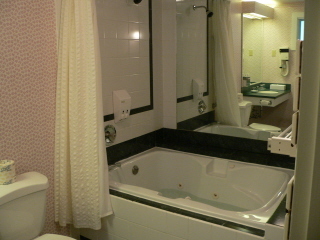 I did the laundry and cleaned the bathroom on Saturday. On Sunday morning, we were off again on a brief trip to Gettysburg, which is getting to be an annual thing. Kelly really needed to take a break from work and got a few days off so she and Lorelai came with us. 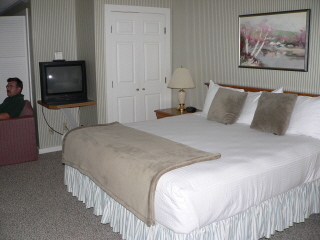 We stayed at Carroll Valley again, which was nice. On Sunday evening, we took one of the many ghost tours, something Kelly has always wanted to do. It was definitely interesting. The tour guide had lots of spooky and fascinating stories. No, we didn't see ghosts and nothing weird happened, except for feeling a bit uncomfortable about a group of trees to the right of where we were standing. We all felt something strange but didn't see anything. 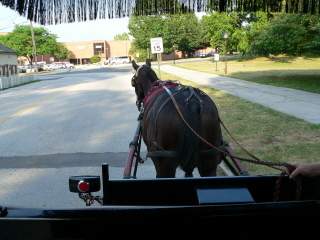 Before the ghost tour, we took a horse and carriage ride through the town. That was really fun. Good thing I didn't take the picture when the horse pooped. Lorelai was intensely fascinated with the horse. She sat up so straight so she could see him. 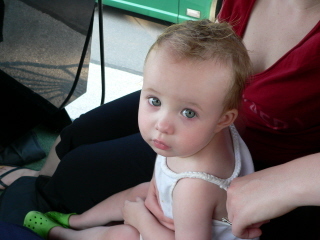 We were amazed at how well-behaved she was, even with the time she spent in the car and the heat. 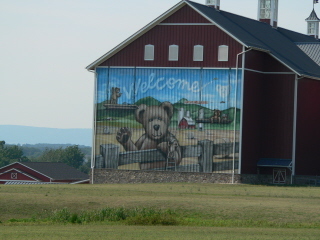 We went from Vermont with temps in the 70s to Gettysburg, where it was in the high 90s the Monday we were there. 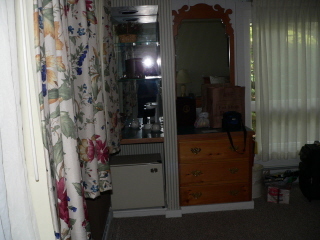 The carriage driver showed us some things we'd never seen before like two Sears Roebuck "modern" homes. 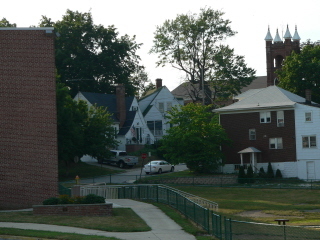 They are the two white houses in the middle of the picture. I'd never heard of this. Years ago, you could actually buy kits to build houses from the Sears catalog. All the precut pieces would arrive at the train station nearest your lot and you had to arrange to move everything to the location where you planned to build your house. Then, you apparently assembled your house. What a concept. Boyd's Bear Country! I was waiting for the opportunity to show Lorelai this amazing place. She had a blast. 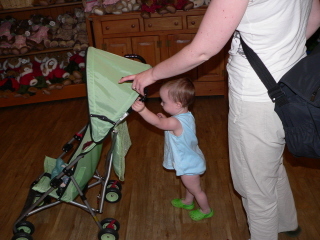 Lorelai picked out bears and a rag doll and had fun pushing them around in her stroller. 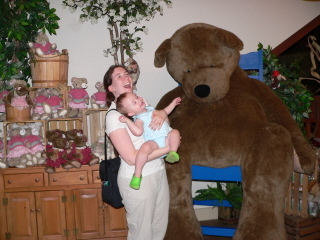 So much for getting her to sit down in front of the bear. After bear country, where we had lunch, we did the auto tape tour of the battlefield since it was near 100 degrees by this time. The tour takes almost two hours and it gave Lorelai an chance to take a nice nap during the midst of the drive, which was great. We had a great dinner at The Dobbin House, a favorite of ours, where the waitress complimented Kelly on Lorelai's behavior. "She can come back any time. We have kids here climbing under the tables." Kelly said, "That wouldn't happen." Of course, no trip for me would be complete without a yarn shop visit. 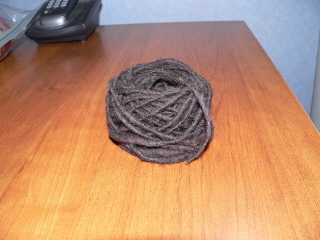 I picked up some fiber and some 650 yards of pretty gray alpaca yarn. Here's the combined loot from Vermont and Gettysburg. Soft, colorful and full of so many possibilities. 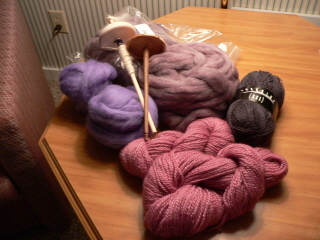 Last month, I joined a spinning guild, the first step in my attempt to learn to spin yarn. I knew this wasn't a skill I could completely learn from a book. I needed to watch someone do this. 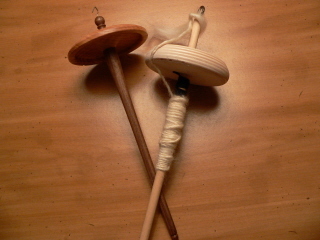 At the spinning guild meeting, the first hour is devoted to teaching beginners. There were two other absolute beginners there as well, which was nice. 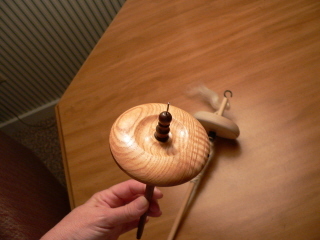 A lovely young girl from Denmark named Ulla taught us to spin on a drop spindle. 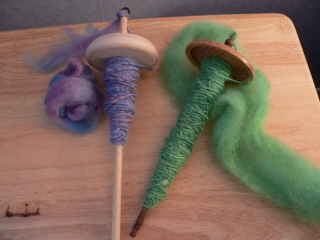 along with some roving to spin. 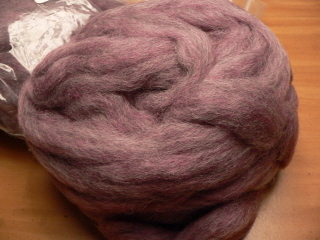 and followed this up with some bits and pieces of dyed fleece I got from the spin guild. 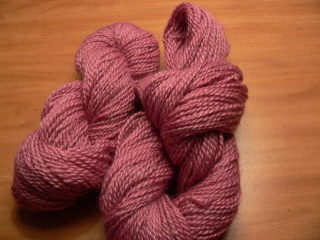 I spun enough for a small skein, which I washed and hung to dry just today. 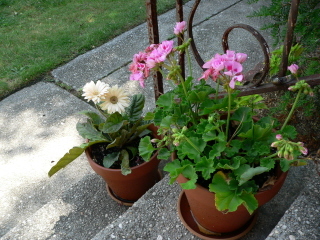 It may not look like much but I'm so excited. 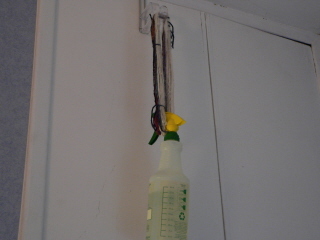 It has to hang with the weight on it until it's completely dry. 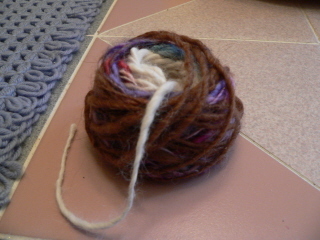 Then, I should be able to wind it into a center pull skein. I'm keeping my fingers crossed. I just want to see how it looks after it's through the finishing process so I know if I'm doing ok. I'm seeing progress. 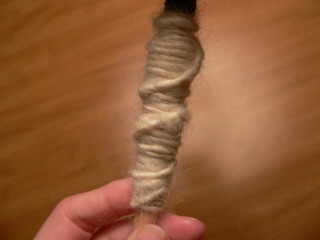 The yarn I'm spinning now looks much better than it did the first few times I tried. Stay tuned for the results. 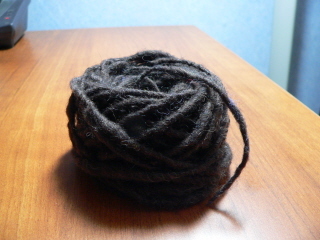 While at the shop in Vermont, I also bought some handspun yarn from the area. It's beautiful. The only problem is that it had no label. The information was on a card on the bin in the store and now I can't remember the yardage! I think it's about 400 yards, if I remember correctly. I think that's it for the recent activities. I've finished a few more projects, which I'll just post to the finished objects page. I really need to finish up some of those projects I've started. They are piling up. The heavens opened up this morning. This is what the street looked like at 9:30 am. 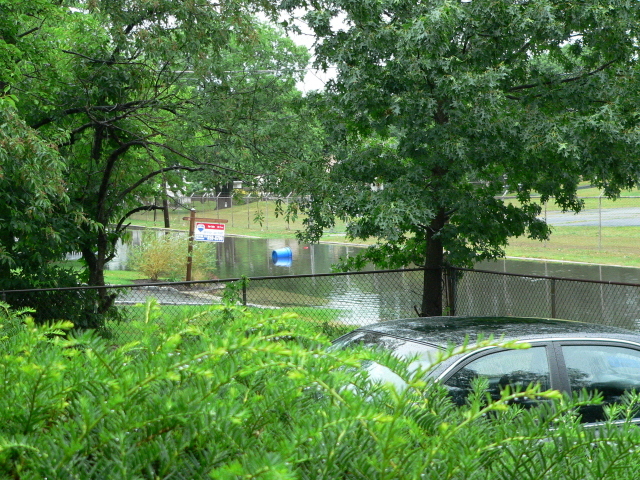 It's better now, though still a little flooded. 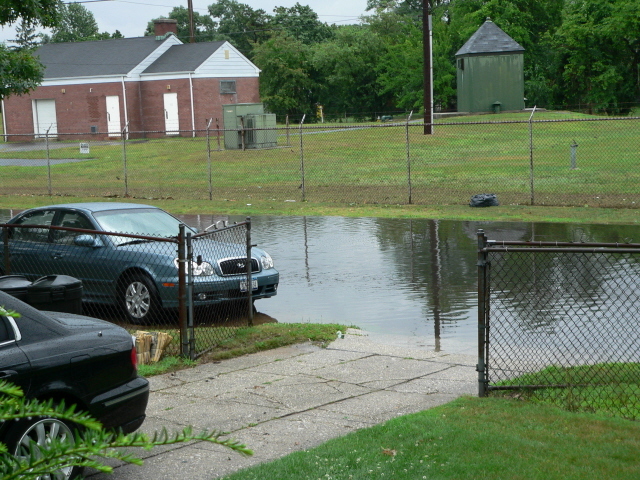 I guess it was just too much rain for such a short period of time. 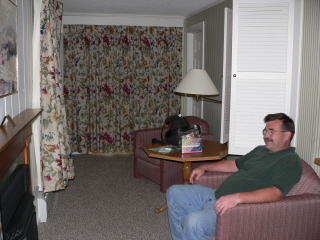 Bill wants this next picture for his desktop. 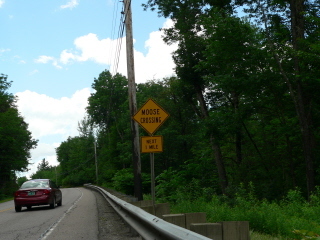 Moose crossing. Don't see that in NY. 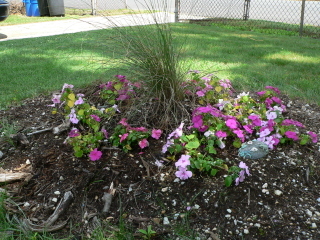 More pictures. It's so pretty here! 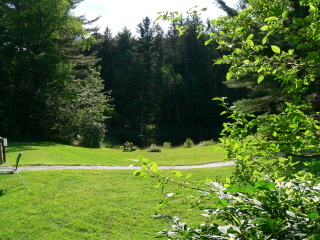 The view from the deck. Hard to see but it's a small lake. Just to the right of the above picture. 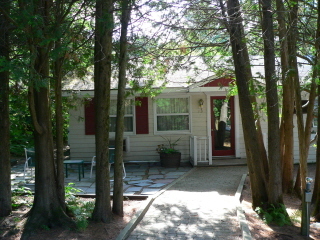 Here's the front of our little "cabin". Look! Baby Christmas trees! 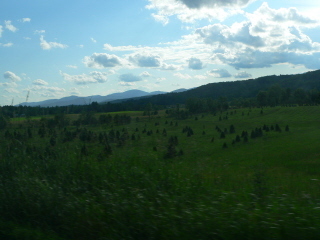 Really, this is a Christmas tree farm. As we were leaving the center of town, the sky suddenly went from sun to clouds and it started to pour. We went to a pizza place called Pie in the Sky for dinner and as we were leaving there, the sun came out again but it was still raining. 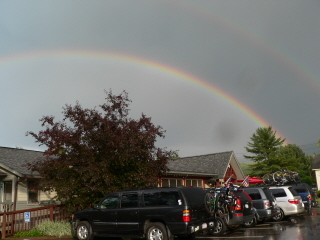 This rainbow went completely across the sky. Yes, I stood in the rain taking a picture. Forecast is for 47 degrees tonight. It's 53 right now and at home, it's 73. Wow. 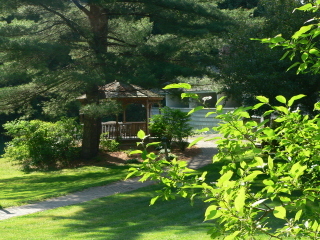 Who goes to Vermont in the summertime?? We do. We don't ski so we wouldn't find much to do here in the winter. We're in Stowe, a lovely little town with tons of places to eat. Seriously, I don't know when I've seen so many restaurants. 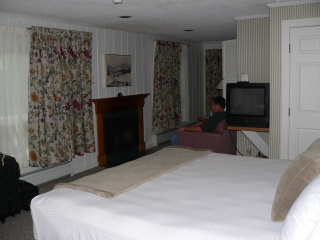 I'm sitting in a room in a beautiful resort set in an 80 acre nature preserve. It's peaceful and...chilly! It's about 65 degrees. I'm sitting in front of a fireplace warming my feet. I found this interesting. 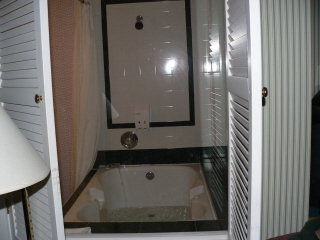 These shutters open on a window from the main room overlooking the whirlpool tub. I'm still trying to figure out the reason for it but it's kinda cool. 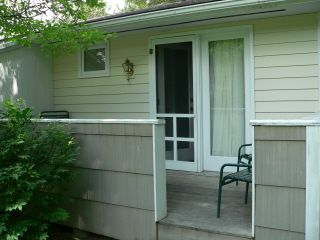 There's a private deck, very nice. More pictures to follow. 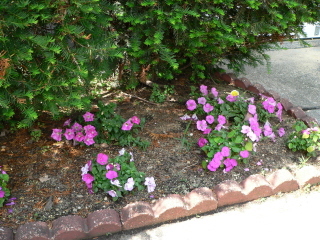 In the meantime, how about a few pictures of the front garden. 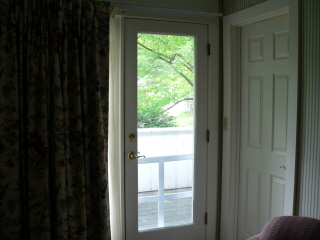 Here's our front door decoration for the holiday. 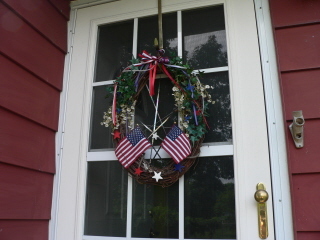 Actually, I put this one up for Memorial day, leave it up for June (Flag Day) and take it down after July 4.